Mumtaz Begum Khalique on the way home with her book after the launch of the First Edition at St Ann’s Library on November 8th 2002. The book includes an interview with her about running the first Asian shop in St Ann’s with her husband. 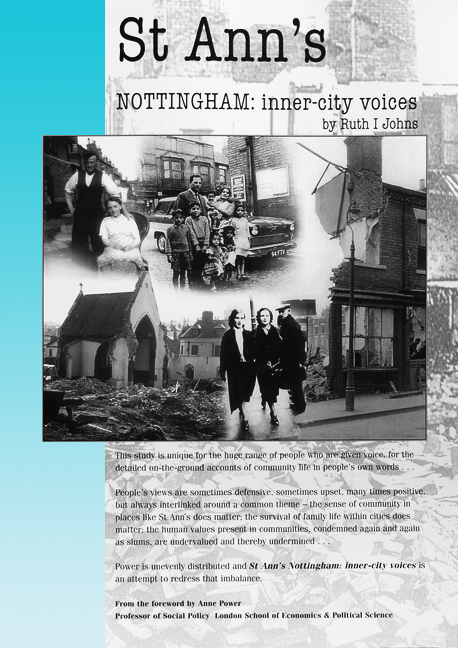 St Ann’s Nottingham: inner-city voices by Ruth I Johns has established itself as a much-loved book on readers’ bookshelves in the UK and abroad. It is a valuable book for those studying social and community studies, housing and urban environment subjects, and social policy. St Ann’s is an inner-city district of Nottingham where 340 acres were bulldozed in the late 1960s/early 1970s and 30,000 people compulsorily uprooted. The ‘old’ St Ann’s was stereotyped as a slum and the ‘new’ St Ann’s as an area of multi-deprivation and crime. But, as this book records, there is much more to St Ann’s than its imposed reputation. This book covers most of the 20th Century and up to 2002. Author Ruth I Johns has been mindful throughout research and writing of this book, its original launch in St Ann’s, in Press interviews and in the book’s developing role as a serious addition to community history that the role of the people of St Ann’s is never overlooked. Creating the book was a participative project in which all, including the author, donated their time. This is one of the most fascinating books in my collection. An ‘epic history’ of an inner-city in living memory. It has been painstakingly pieced together in partnership with the people of the district. Johns makes no effort to homogenise or aggregate the diverse views of this working class neighbourhood. The community, she says, ‘doesn’t speak with one voice, it shouldn’t speak with one voice. And if you think it speaks with one voice, it’s a ‘phoney’. St Ann’s Nottingham: inner-city voices is the result of a marathon project taken on by a woman drawn to the area and driven by a desire to record ‘the way St Ann’s was and the way it is’ through a vast array of facts and opinions. Many perfectly good houses were demolished as whole areas were cleared of homes, pubs, clubs, cinemas and people. Read that story in the words and pictures of the people who lived through those difficult times. But much more, read about life before the bulldozer arrived and then life afterwards as new communities started to form. Not just a book for those interested in Nottingham and St Ann’s, but a chronicle of life throughout the last century and stories that will be similar to many found in other cities. Urban planners, social scientists, politicians and others could learn much from listening to the voices in this book. An astonishing achievement. I have looked at a lot of local history publications for the post-war period and know of nothing else remotely like it.